Every distillery has a recipe for its various brands. Four Roses is unique in that it has 10 recipes. These are created by combining one of the distillery’s two mash bills – a high rye (35 percent) known as B and a low rye (20 percent) known as E – with one of its five yeast strains: V (delicate fruitiness), K (slight spice), O (rich fruitiness), Q (floral essence) and F (herbal essence). Four Roses Yellow Label combines all 10 recipes; the Small Batch combines four; and the Single Barrel is, as the name would suggest, drawn from one recipe. The Limited Edition Small Batch released annually may be drawn from any number of the recipes. 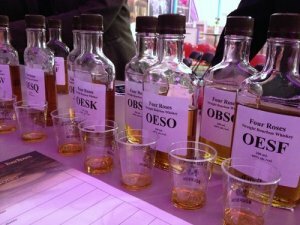 I got all that, but I was still baffled for a long time by the names of the recipes: OESO, OBSF, OESQ, EIEIO — until Dan Gardner, Four Roses’ regional sales manager, broke the code for me. Here’s the secret: Only the second and the fourth letters matter. The first and third letters are the same for each recipe. O stands for “Old Prentice,” a designation made during the years Seagrams owned the distillery, and S stands for “simple” or “straight” distillate. The second letter designates the mash bill and the fourth letter is the yeast strain. Each recipe has a distinct flavor profile. The effect of the yeast strains on the mash bill can yield some unexpected results. The K yeast strain, for instance, brings a lot of spice and mint; adding it to the low rye bill can result in a spicier bourbon than mixing another yeast strain with the high rye bill.